Sports brand Asics appointed Imagination to design and deliver its hospitality venue for guests during the London 2012 Olympic Games. The Asics venue – located in Romford Road close to the Olympic Park in east London – accommodated up to 200 guests each day of the London 2012 Olympic Games. The venue was used as a base for Asics' key customers, business partners, media and athletes, and featured a 36sqm video wall for streaming live Olympics coverage. To highlight the company’s sporting heritage, which dates back to 1949, Imagination used the entrance to the venue as a space to depict sports performance and Asics' involvement. The brand this year designed a shoe for the Dutch Olympic team. Photos of athletes including Irena Szewinska, Lasse Viren and Jonathan Edwards, accompanied by quotes and statistics detailing their sporting achievements, showcased the brand's involvement in the Olympics. The opposite wall was designed to complement the display, charting each of the host cities from 1948 to the present day. "The Asics Olympic venue has proved to be an engaging and interactive space for visitors," said Lucie Cooper, account manager, Imagination. 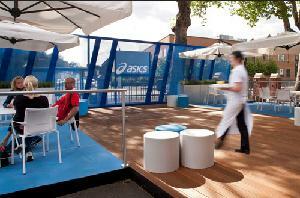 Brand ambassadors shared Asics' messages with visitors, while the space also showcased product innovations.